Click on any of the photos above to be directed to Tony Moran’s web site. 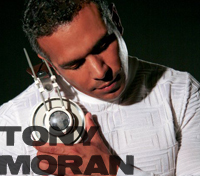 The thunderous beats of New Yorker Tony Moran have resonated throughout clubs and arenas around the world, and have dominated the Billboard dance charts for decades. When artists like Mariah Carey, Whitney Houston, Madonna, Beyoncé, Britney Spears, Rihanna, Mary J Blige, Janet Jackson and Jennifer Lopez want to tear up the dance floor, they call upon the top-ranked DJ and Grammy-nominated producer and remixer for The Moran Sound --- hard hitting tribal house anthems infused with the latest cutting edge sounds in electronica.